When Burdock Brown decided to suspend the use of magic in the Land of Een, he named the mysterious Leerlin Lurk as his Agent of Magical Detection. As such, Lurk acted as a sort of sheriff, prowling about Een in hopes of finding and imprisoning perpetrators. 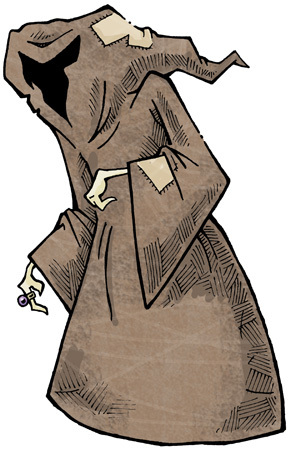 Agent Lurk kept himself hidden in the folds of an old brown cloak, which made it difficult to ascertain his age. In truth, this was a shadow cloak, allowing Agent Lurk to turn invisible at a moment’s notice, giving him great advantage when it came to sneaking up on unsuspecting Eens. Agent Lurk also wore a strange ring that was set with a round, purple Kazah Stone. The slippery Een stole both the shadow cloak and Kazah Stone from his master, the wizard known as Shaden Shiverbone. Agent Lurk pursued and menaced Kendra Kandlestar across the wilderness as she journeyed to the Rumble Pit. He seemed as resourceful as he was sinister, plaguing the girl at every step. In truth, he had a hidden motive, which was to prevent Kendra from realizing her true potential as a sorceress. This was because Agent Lurk blamed Kendra for his own magical ineptitude. Agent Lurk seemed to have an affinity with the wild monsters of the outside world. He could tame skarm, for example, even riding the worm-like beasts. Eventually, Kendra was to solve the mystery of Lurk's past and unmask the villainous character. When the witch Shuuunga marched her armies upon the Land of Een, Lurk had to make a decision about whose side he would take.